IE University and Brown University will bring together some 40 opinion leaders and experts from higher education institutions in Africa, Asia, the United States, Europe and Latin America between April 4 and 5 for the 10th annual Reinventing Higher Education conference, promoted by the IE Foundation. Jim Yong Kim, who stepped down as World Bank president in February and who is a partner of Global Infrastructure Partners (GIP), will deliver the keynote speech, Building the Human Capital of Tomorrow. The discussion platform, which will be held for the first time in the United States, brings together experts who are currently leading the transformation of higher education to analyze the outlook for higher education around the world. Since 2010, more than 250 speakers from all over the planet have attended Reinventing Higher Education. In addition to discussing the issues affecting the future of education around the world, participants this year will look at how university managers, policy makers, academics and entrepreneurs can work together to build human capital into the future as well as responding to the challenges of a constantly changing world and its labor market. 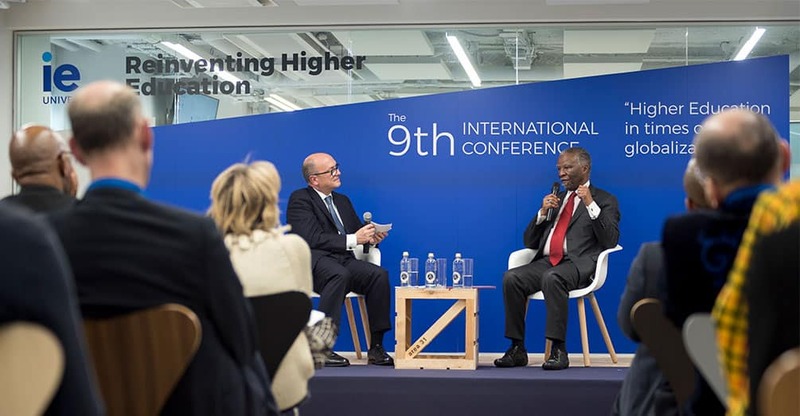 Reinventing Higher Education consists of a series of panels moderated by journalists from international media such as The Economist, the Financial Times, The New York Times, QS and Business Week, with 37 speakers from 20 countries taking part. Reinventing Higher Education will feature the presidents, founders or vice-presidents of universities and centers such as the African Leadership University (Mauritius / Rwanda), the American University of Beirut (Lebanon), Brown University (United States), the Community College of Rhode Island (United States), the Hamad Bin Khalifa University (Qatar), IE University (Spain), Koç University (Turkey), the London School of Economics (United Kingdom), Luiss University (Italy), the Massachusetts Institute of Technology (United States), Renmin University of China (China), the Rhode Island School of Design (United States), the Sorbonne University (France), the Tecnológico de Monterrey (Mexico), The New School (United States), San Andrés University (Argentina), the Universidad del Desarrollo (Chile), the Universidad del Pacifico (Peru), San Francisco University of Quito (Ecuador), the University of Cape Town (South Africa), University College London (United Kingdom), the University of Ghana (Ghana) and the University of Miami (United States). Also participating will be executives from companies and institutions such as the Bank of America, Barry-Wehmiller Companies, the Council of International Schools (CIS), Global Infrastructure Partners; McKinsey & Company and The Africa-America Institute, among others. The presidents of Brown University and IE University, Christina Paxon and Santiago Íñiguez will host the conference. Among the experts from IE University will be Nick Van Dam, Chief Learning Officer, a global expert in leadership and training, and director of the IE Center for Learning Innovation.